Ask any online retailer what their primary business goal for this year is, and more often than not, you’ll get an answer along the lines of: “I want to grow my business.” But with a growing business comes growing responsibilities, namely making sure your back-end is ready to handle and sustain this growth. Before you scale, it’s critical to first optimize your retail inventory management, or face the risk of missing out on sales due to a lack of stock, losing inventory across channels or sacrificing margin due to seemingly small inefficiencies. Inventory management is the often overlooked but essential foundation for smooth operations, ensuring ordering, stocking, fulfillment and return processes run efficiently, especially if you sell on multiple channels. While you’re likely already aware inventory management is an important part of keeping your ecommerce ship afloat, did you know that honing in this process and leveraging its accompanying data can actually help you save money while you grow? It’s not magic — it’s mathematics. 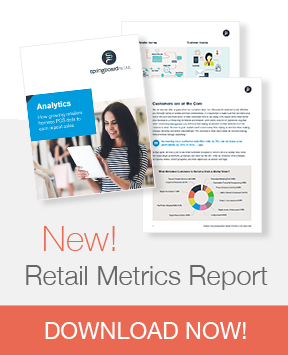 Read our Retail Inventory Report to Learn More! With great inventory management using POS retail inventory management software comes a wealth of great data, should you choose to put it to use. Once you learn how to manage inventory effectively, you can track how much and which products you are selling, who you are selling it to, when you are selling it and how or why the buyer was prompted to convert. All of these data points across all of your channels work together to help you pinpoint the best way to price your items, move stock where it is needed, fulfill orders quickly and keep customers happy, regardless of where they shop with you. Here are a few ways to ensure your inventory back-end is in peak shape, and ideas for utilizing your inventory management data to save money and grow strategically. Paying attention to sales during certain time periods can help you forecast sales for those items in the future. Holidays and seasons are two occurrences that you can nearly count on sales for certain items. For example, if you are a jewelry retailer, you can expect a rise in sales during February around Valentine’s Day, as well as widely-celebrated holidays, like Christmas in December. If you sell heavy winter coats, your North American customers may make up the majority of your business during November through February, while your Australian customers will be more likely to shop with you during June through August. Pay attention throughout the year to make note of when the sales of certain products have extraordinary spikes, then analyze your marketing efforts, current events and other factors to figure out why. If you can identify the reason sales went up during a certain time frame, you can also deduce whether or not it will happen again at the same time next year under the same circumstances, helping you plan inventory accordingly. These insights can also help you plan future ahead for ad campaigns and marketing initiatives, ensuring you make the most of such occasions where consumers are in desperate need of your products. It’s equally as important to recognize when sales spikes are not tied to a recurring event, such as a natural disaster, so that you do not order extra inventory off of an incorrect assumption. If only you could predict what your customers want before ordering it...well now that you’ve got your inventory management optimized, you can. Sales forecasting is a method of leveraging existing data you already collect and using it to make predictions about future business operations — and it’s a lot easier than it sounds. To forecast sales, simply track the sales of your products on a line chart each month. As you continue to add more data, you may be able to spot trends. For example, if you notice a certain item showing sales growth of 1.8% every month for the last two years, you can assume it will continue to grow at a similar rate. Ecommerce platforms like BigCommerce allow you to view SKU sales for various periods or, if you use an inventory management tool like Springboard Retail, forecasting is even easier with customizable reporting tools that allow you to compare sales from up to three time periods at once. 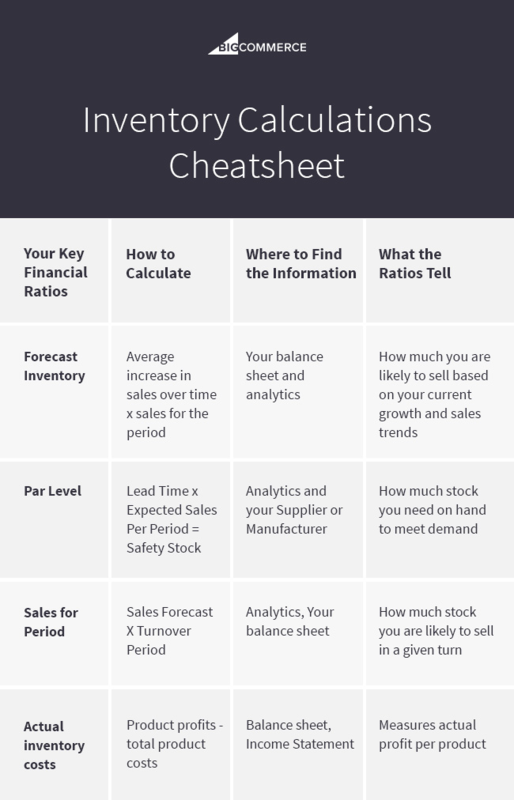 Sales forecasting helps you make an educated guess on how much of each product you are likely to sell likely to sell in the future, helping you better predict how much stock to keep on hold. Check in on your forecasting algorithm at least once per quarter to measure how actual sales turned out compared to your predictions; this will help you home in on your predicting abilities over time. Also, make sure to forecast sales for each channel individually. This will help eliminate the risk of any abnormalities on one channel interfering with your overall predictions. Oftentimes, the hardest part of running a business on multiple channels is the delicate dance of ensuring you have enough stock on each channel, and having the flexibility to move stock around according to demand, even when you don’t have time to physically keep an eye on it. To ensure you always reorder more stock at the right time, calculate your “PAR level,” or Periodic Automatic Replenishment. Your PAR level is the lowest amount of stock you should ever reach before ordering more, ensuring that you neither have too much stock at one time nor risk selling out. Here’s an example of this formula into action. Let’s say you usually sell an average of 40 pairs of socks every day. You have a lead time, or time it takes to put in the reorder from your manufacturer and receive new stock, of 14 days. This means at the very minimum, you should not go below 560 pairs of socks in your warehouse before ordering more. However, you may also want to build in an extra safety buffer just in case of an external factor. For example, how long will it take you to upload the new stock to your inventory on all of your channels? What if there is a natural disaster and your shipment is delayed? What if you receive unexpected returns or an unanticipated large boost in sales? Adding a 10% buffer to your PAR level can add some peace and mind without putting too much strain on your warehouse. In this case, 10% of 560 is 56, so you would order 616 pairs of socks every time you restock. Again, inventory tools like Springboard Retail can completely automate this process for you in combination with your ecommerce platform. Modern POS software makes it easy to view real-time inventory across all of your channels at once, providing a holistic view of sales and stock. 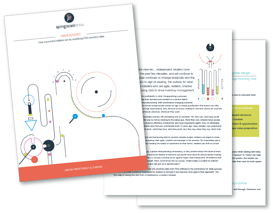 This guides retailers in making strategic decisions about transferring inventory from one channel to another, in order to optimize margins and product and channel sales performance. You can also set your inventory management software to automatically reorder more stock based on PAR levels. Your PAR levels will even adjust automatically over time based on how items are selling. The process of getting your inventory in tip-top shape will help you save money in itself. Once you have a good handle on your inventory management, you have access to the data that can help you to better understand the minimum price you can set an item at to make the profit you need to sustain business. First, you need to figure out the “real cost” of your inventory. This number includes not only the price of the products you are ordering, but the related costs of receiving it (freight costs), storing it (warehousing costs), marketing it, delivering it and external factors (dead stock and inventory damage or loss). This number will range widely for each retailer, so map out your products’ entire journey from manufacturer to customer to account for every factor. This is where calculations can start to get tricky, as you’re taking huge expenses and trying to break them down to product level. However, spending the time to figure out the real cost of your inventory is worthwhile, because only then can you determine the “actual profits” you’re making off of each sale, helping you price more accurately and sustainably. Once you’ve added up the total cost of obtaining a product, you can calculate the actual profit by subtracting the total costs of product from the total sales per product. These are just a few ways to begin thinking about inventory management optimization. This cheat sheet from BigCommerce breaks down the most common calculations you’ll need to keep in mind as you continue to optimize your internal processes. As a business owner, you are faced with many decisions on how to spend your valuable time and money. In addition to a trusty ecommerce platform, implementing a modern POS system with two-way inventory data syncing features will provide you with the real-time data you need to make strategic business decisions to grow profitably and sustainably over time. Springboard Retail was built with point of sale inventory management for multi-channel retailers in mind, meaning it is user-friendly no matter how many stores you need to keep track of. Fast shipping, flexible shopping options and happy customers — it all begins with optimized inventory management.